Thank you to all of you who came out for our December handicap. This event was hosted by the Bosque Running Shop and they provided us with not only a wonderful 4-mile course but also refreshments at the end. The course was a 2-mile dirt loop close to the shop. Each participant ran 2 loops so it was a great course for spectators to cheer everyone on. It was a cold morning but beautiful for the run. Krista Runtz killed it on this course and ran one of her fastest times in recent months. 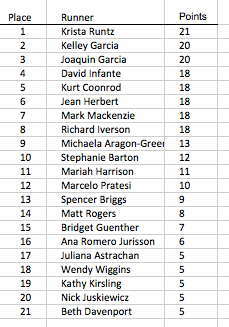 She was our handicap winner, beating out Joaquin and Kelley for first place. As a prize, Bosque Running Shop gave her a hat to commemorate her win. As the first male, Joaquin also received a hat as a prize. Everyone was a winner, though, as we all got to enjoy breakfast burritos and hot coffee after the run. 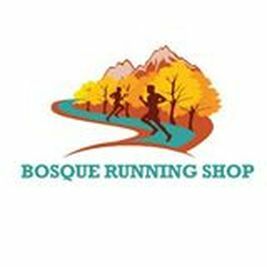 Bosque Running Shop (BRS) is located in the shopping center at the NE corner of Coors Blvd NW and Montano Rd NW. Within that large shopping center, BRS is located near the south end.